Craving something, but not sure what it is? The BID has the answer: Come to Lincoln Square. Find it all in the City’s most accomplished neighborhood. On and beyond Broadway and Columbus Avenue awaits a world of stellar live performances, tuned-in shopping venues and a bewitchingly diverse array of food. Throughout the year, the Lincoln Square BID dives in and organizes events that appeal to every interest, every palate and every age. In the heat of summer and the brisk air of winter, the Lincoln Square BID keeps the good times rolling with interactive and free events for all. In the spotlight are Lincoln Square’s diverse retail scene, storied cultural arts, acclaimed museums and celebrated academic and non-profit institutions. The official count tells us that 25,000 holiday celebrants, among them repeat revelers and newcomers came together for the BID’s 18th annual Winter’s Eve at Lincoln Square. The City’s largest free holiday festival, Winter’s Eve takes place up and down Broadway, indoors and out, unfurling an extravaganza of good cheer, palate-tickling food, action-packed activities and a heady range of live music and entertainment. All a reveler need do is sip hot chocolate, peruse the night’s action-packed program and take a leisurely stroll to its destination. Find dozens of family activities in the stores, public spaces and along the sidewalks from Columbus Circle northwards to 68th Street. Discover what’s in-store for everyone on your list-- and yourself—in area shops offering special discounts and free gifts. Watch a City dance company perform street theater. Chill out to jazz performances at Time Warner Center. Eat at one -- or all three-- outdoor food-tasting venues supplied by over 30 of Lincoln Square’s best restaurants and eateries. In beautiful Richard Tucker Park, dance to a merry range of music. Save time, too, for Dante Park and enjoy more live performances. The generous participants of Winter’s Eve include 100 neighborhood businesses (national and local), plus Lincoln Square’s cultural and civic organizations. Share in the warmth, visit our website winterseve.nyc for more information about the 19th Annual Winter’s Eve at Lincoln Square. And click here to watch highlights from Winter's Eve 2017. Take a late-summer break in the shade of Richard Tucker Park and relax at Lincoln Square’s Free Lunchtime Concerts in partnership with the MTA’s MUSIC program and supported by TD Bank, the concerts are held every Wednesday, in July and August from noon until 2:00pm. All ages gather, often clapping and dancing to exciting programs encompassing genres ranging from rhythm and blues, high-energy jazz standards, classical, funk, swing, world music and more. Between music sets, participate in yoga and restorative stretch sessions from instructors from the West Side Y. The Link to Lincoln Square, our email newsletter, is published bi-weekly and sent to approximately 5,000 subscribers. Its purpose is to constantly connect and inform the public about what’s happening in Lincoln Square. Find out what’s new, who’s here, who’s making news, and learn about special offers for Lincoln Square insiders. To subscribe, please enter your e-mail in the subscription form at the bottom of the page. Want to promote your event or special offer in our eblast? Contact us at (212) 581-3774. Is a terrific neighborhood resource– regularly updated and revised– that makes sure you can find all the amenities in Lincoln Square. The attractive folding map is distributed to all shops, businesses, and residents in the district, as well as tourist offices around the City. 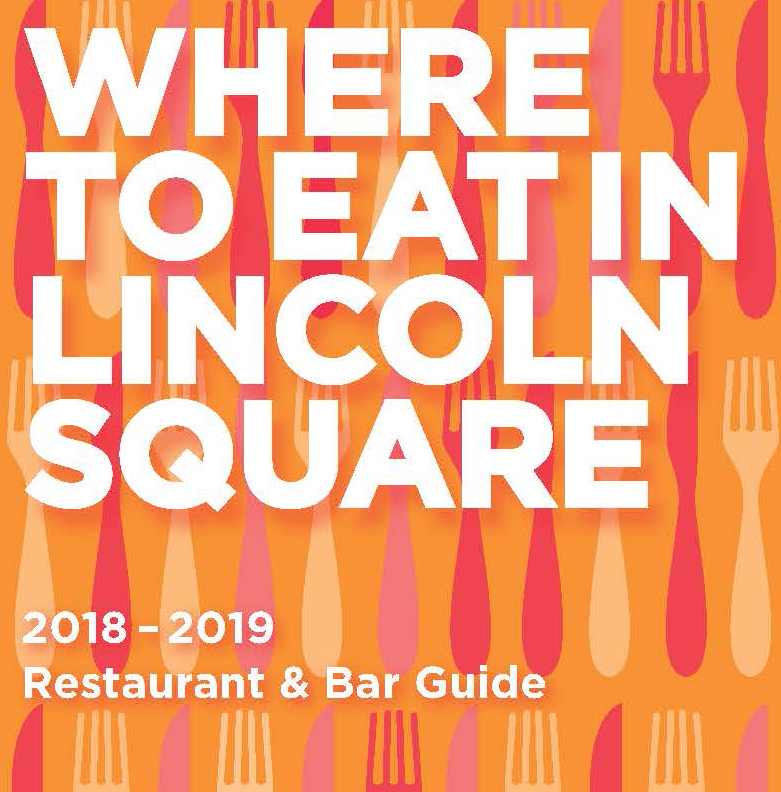 Lists the diverse array of restaurants, cafes and bars within Lincoln Square. Pick the guide up at our neighborhood Information Carts, or at business and cultural locations throughout the district. Bon appétit! Nothing says welcome to Lincoln Square like the BID’s helpful guides. The BID is the go-to organization for the neighborhood. On a day-to-day basis, the BID’s attention to its members is reflected in the actions of our Public Safety Officers who, doubling as Lincoln Square ambassadors, help area guests find a particular restaurant, store, museum, school or entertainment destination. Trust them: the officers can show you the way. In addition, all year long, the BID places three colorful information carts in highly visible areas within Lincoln Square: at Columbus Circle, Dante and Richard Tucker Parks. The carts aid tourism and local business by stocking maps, calendars and event listings; not just in Lincoln Square but also throughout the city. Cheerfully staffing the carts in the warmer months are high school students from the Martin Luther King, Jr. Educational Campus, college students and ReServists – retired adults. All are well-trained, knowledgeable ambassadors. Stylish graphic banners hang from area lampposts, branding and promoting Lincoln Square. The high-profile banners often announce exciting events such as Winter’s Eve at Lincoln Square. Interested in sponsoring a series of banners?